Do you ever just assume that a particular designer or aesthetic just isn’t for you, and therefore you never even give it a try? That’s me, with all things preppy or southern style. I just have never seen myself rocking gingham to good effect. I don’t know what to do with linen clothing and anything with an eyelet looks too twee on me. Give me edge, give me leopard, give me bold primary colors — that’s me all day. 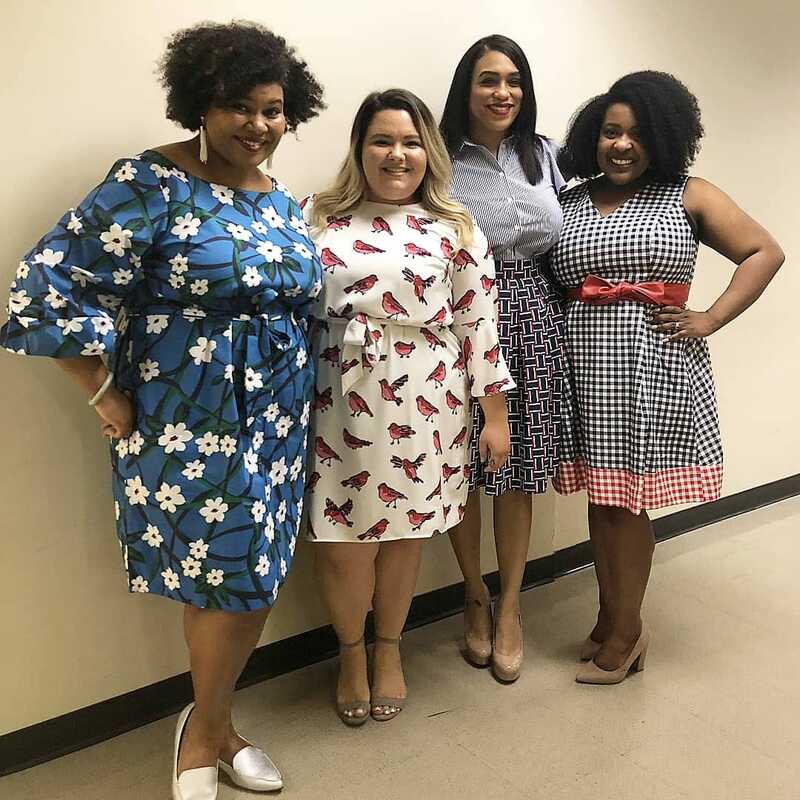 So I really didn’t ever think I’d find looks to suit my aesthetic in a collection intended to capture southern style, until I was invited to try Draper James X Eloquii, the limited edition collaboration with Reese Witherspoon’s southern style brand. If I may be completely honest, when I first saw some of the items from the collection I wasn’t sure about how it would look on me. There are bows and busy, quirky prints, ruffles and interesting sleeves, animal motifs and lots of gingham. 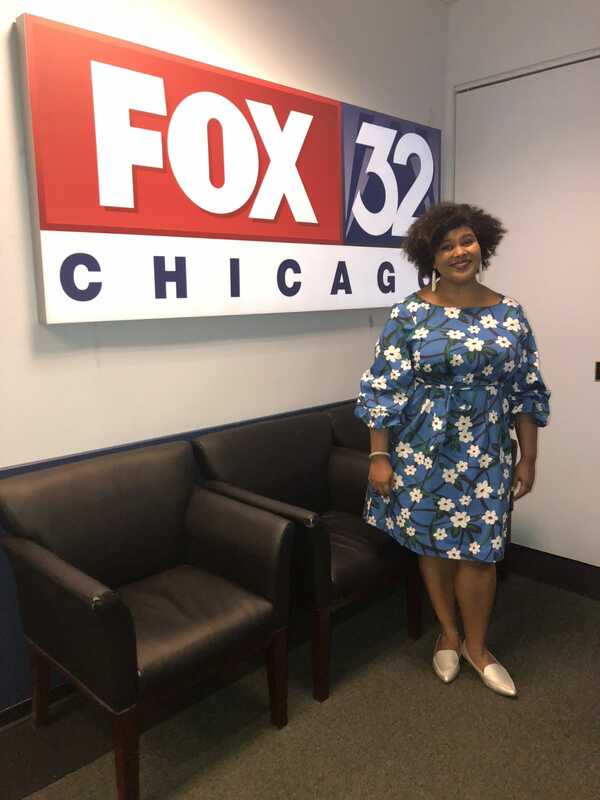 I was offered the opportunity to model the collection on FOX 32 Chicago at noon, and chose this balloon sleeve shift dress in the collection’s signature magnolia print. It was love at first try! This dress is bold, fun, and fit my curves perfectly with no need to size up or down. Here’s how I rocked it! Lucky me, I got to film this appearance with some of my favorite peers in Chicago! Here I am with my boo Natalie in the City, The Glam Mom and LaNita, AKA @OneCurvyWife who is Eloquii’s manager here in downtown Chicago! And they’re wearing super cute pieces from the collection too! Natalie’s rocking the flare sleeve dress with the bird print, Michelle is wearing two pieces I wouldn’t have thought of together but totally work — the graphic pleated midi skirt with the flutter sleeve blouse. I’m not great at print mixing, so this combination inspired me! 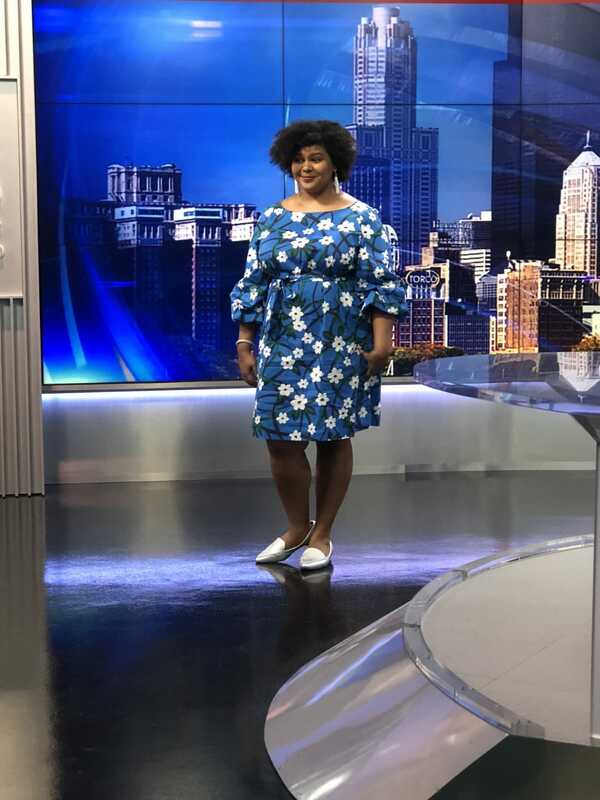 LaNita’s rocking the gingham blocked fit and flare dress, which is so cute on her! As you can see, I was feeling myself in this dress just a little. Thanks for the opportunity, Eloquii! You can see our segment right here. And you can shop the full Draper James x Eloquii collection here, I love the parrot jumpsuit and chambray dress the most! Those are my top picks, TBH. Affiliate links are included in this post, so if you shop you are supporting Afrobella.com. Thank you! All you ladies look just fresh, fab and funky! This dress is beautiful on you.